1. 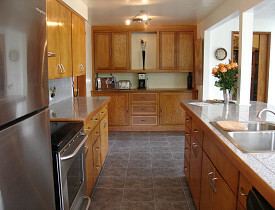 Planning, planning and more planning: The biggest monkey wrench in kitchen remodeling projects is poor planning. Minimize delays, mistakes and cost by plotting the project from beginning to end, detailing each stage of construction. Visit design centers and consult with experts who will help you narrow down choices and assist in drafting a new layout for appliances, cabinets, lighting, etc. Choose and purchase supplies in advance and have them on-site before beginning work. 2. Adopt the all-in-one approach: Unless you’re customizing, take advantage of one-stop shopping in big box stores like Lowe’s, Home Depot or IKEA to purchase what you need and dramatically cut down the aggravation of running around to purchase cabinets, countertops, flooring, lighting, appliances, organizational components, etc. In addition to building supplies, these stores offer competitive pricing on small to large items from most major manufacturers, including specialty items. They’ll also help with the planning process. If big box stores rub you the wrong way, you could try making a trip to a Habitat ReStore, where you can support Habitat for Humanity while purchasing deeply discounted like-new remodleing materials. This national chain offers additional services, which vary by location. For instance, the Habitat ReStore in Houston offers deconstruction help for Houston remodelers. Tip: Bulk purchases also put you in a better position to ask for (and receive) a contractor’s discount! 3. Let someone else do the work: Planning to do most of the work yourself is a noble thought, but remodeling a kitchen is one of the most difficult DIY projects. The most common mistake is under-estimating the amount of time it takes to complete the work, the skill level or physical demands required. If it’s in the budget, think about hiring a subcontractor to do a portion of the work for you, and tackle what you feel comfortable completing or what you can easily fit into your time schedule. It is important to hire a professional plumber if you are replacing or moving plumbing in your kitchen -- you could find yourself sad and wet if you overestimate your plumbing skills. 4. Work with what you have: Sometimes small changes produce big results! Not every kitchen remodel requires total demolition and extensive rebuilding from scratch. If the sink and/or appliance placement works in the existing kitchen, keep original layout. Utilize existing appliances and upgrade around them. Got cabinets that are solid wood but looking a bit weary? Call a resurfacing company, or restain/paint them in less than half the time it would take to demolish the old and install the new. Adding new hardware or installing an island with additional seating and organizational space may be all you need to upgrade your kitchen into a functional space. 5. Break it up into manageable pieces: Who says you’ve got to kill yourself doing it all at one time? Unless you are completely demolishing the old, think about breaking the project into manageable pieces to minimize kitchen “down time.” Simplify upgrades into “mini-remodels” and take a breather in-between. The trick is making sure you plan correctly or it could work against you. For example, replace flooring after new cabinets are installed; otherwise, you might find size differences or changes in layout will leave flooring gaps. Unsure how to do it? Go back to the planning stage first. Laura Foster-Bobroff writes for Networx. Get home & garden ideas like this on Networx.com.